Is LinkedIn Locking Down Public Profiles or Just Having Problems? Have you noticed anything different about LinkedIn recently – specifically with regard to viewing 3rd degree profiles, searching for headline phrases, searching by first and last name, and using Google and Bing to X-Ray search for public profiles? I have, and either I am encountering some serious and hopefully temporary errors, or LinkedIn may finally making serious moves to make it very difficult to find public LinkedIn profiles for free. Let me show you what I’ve discovered so far, and please share back any additional findings, or simply let me know that I am the only one affected. So it started when I was looking through my inbox to accept invitations to connect. I tried to click on a few profiles to learn more about these people before accepting their invites. This is annoying, because if someone is trying to connect to me, shouldn’t I be able to at least look at their profile to determine whether or not I want to connect with them? So then I tried searching for her by her first and last name. This is definitely different, because previously, if you searched for someone by their first and last name you could see their full profile even if you weren’t connected to them, presumably because LinkedIn assumed that if you had someone’s full name, you likely knew the person. This was a sound assumption and solid user functionality for non-recruiters going to LinkedIn to search for friends and current/past colleagues. Of course, leave it to sourcers and recruiters to exploit this functionality to the point that it might prompt LinkedIn to change it. I thought this whole experience was odd, so I decided to do some additional exploration. 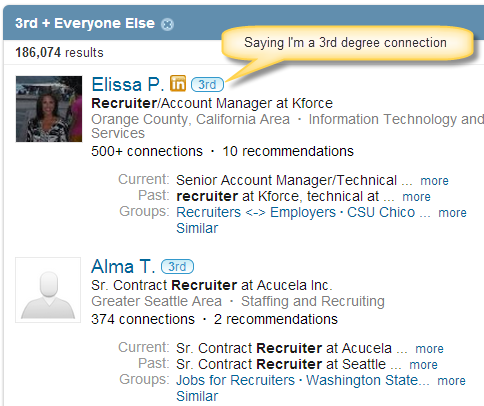 Notice that LinkedIn shows that Elissa is a 3rd degree connection of mine, yet when I click on Elissa’s profile, LinkedIn then claims she is a 1st degree connection (nice bug, yes Irina?). I get the familiar “You and this LinkedIn user don’t know anyone in common,” even though we share a group! So I then went into the group to search for him and I was able to find him, also verifying that I can still send messages to group members who haven’t closed that door. Then I went back and searched for him by his first name and title and I noticed that LinkedIn now thinks he is out of my network, even though I just found him and LinkedIn claimed he was a 3rd degree connection! Strange! By the way, if I click on this result, LinkedIn won’t show me his profile. If I am logged into LinkedIn, LinkedIn claims the profile is not found. So that worked well when LinkedIn didn’t know who I was on LinkedIn. That doesn’t work at all. Could she be someone who customizes her public profile to not show her headline phrase, or perhaps set her public profile content to “basic,” restricting Internet search engines to only her name, industry, location, and number of recommendations? No – because a simple LinkedIn X-Ray search from an Incognito window for her name and location doesn’t return her profile (the one Angela DuBois that does come up isn’t the right person). But as I try to use LinkedIn itself and Google and Bing to find public profiles of random people, I am getting different results than what I used to see, and some of my usual techniques aren’t working as well as they used to, or at all. I am not sure if LinkedIn is simply suffering from technical difficulties or if LinkedIn is making changes to reduce free people search functionality and utility in order to prompt more people to pay for premium accounts (or if their tinkering for the latter is causing the former!). 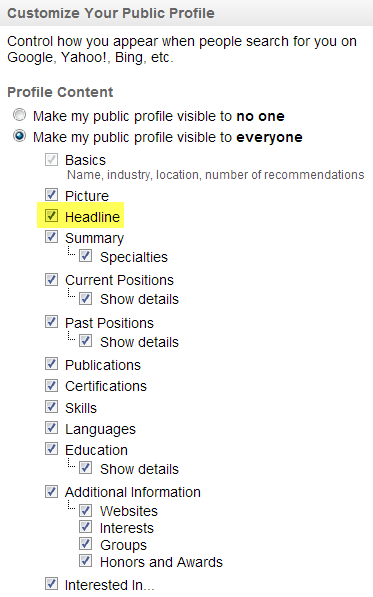 Have you noticed any changes to your ability to view 3rd degree profiles inside of LinkedIn and your ability to use Google and Bing to X-Ray search for public profiles or am I alone?